Tom immerses himself in “Three Billy Goats Gruff” at the Salt Fork Festival. There’s a secret to storytelling and Tom Swan has discovered the magical way to tell or read a story and make it come to life. Children listen closely as he tells his tales and even adults are drawn into his stories. Years ago Tom listened to the Minnesota Public Radio Show, “A Prairie Home Companion” as Garrison Keillor read “Tales of Lake Wobegon”. He read with such expression that Tom decided he would like to try telling stories too. Tom’s daughter, Aili, and mother, Julia, accompanied him to the National Storytelling Festival. In order to get some first-hand experience at listening to great storytellers, Tom and his family have attended the National Storytelling Festival in Jonesborough, TN several times. Here, all that is permitted to tell a story is a mic and a stool. Aili is with her dad, who wanted to surprise old college friends in Colorado so dyed his hair blue. People don’t understand how entertaining stories can be if they are told with enthusiasm. Stand-up comics and one-man shows depend completely on capturing the audience through expression. Too often readers and storytellers simply read, and that’s just not enough to seize and keep the attention of the audience. Tom continues the Swan Family tradition of performing with puppets. To tell a story well, the storyteller must bring back to their mind why the story is important to them. All stories are not fun; some have a poignant or nostalgic theme. Tom practices telling stories while driving his car. Most important is to memorize the first line. Once you get started the rest just flows into place. Usually, he has an outline in his mind so the major points are covered. When he writes the story down, it’s usually after he has told the story to a group. His first storytelling adventure was with the Zanesville Christian Women’s Club where he recited the poem, Cremation of Sam McGee, in a meaningful manner. The kilt reflected his Scottish ancestry when he was inducted as president of the Ohio Doctors’ Wives’ Club. Tom is married to Dr. Linda Swan, an obstetrician at Genesis Hospital in Zanesville. As a result, Tom has become very involved in the National AMA Alliance, which he calls The Doctors’ Wives’ Club. He has been state president and involved nationally in their organization. One of his favorite dishes to prepare is roasted leg of lamb with new potatoes and red wine. Tom has led an unusual life as a housewife. Now, however, his children are adults with his daughter being in medical school and his son a State Trooper. So today he lives the life of a trophy husband when he isn’t out telling stories to places like The Salt Fork Arts & Crafts Festival, Dickens Victorian Village, the Celtic Society, and various schools and churches. This man loves a mental challenge. Physical fitness is important in his life. He wore a kilt when participating in the Buckeye 4 -Mile Run. Tom grew up in Cambridge, Ohio and graduated from Miami University, where he majored in zoology and was a cheerleader. Since his father and grandfather were doctors, it seemed that he might follow in their footsteps. But Tom really didn’t enjoy the studying required to be a doctor so decided to become a high school science teacher, which he did for seven years. As auctioneer at the AMA Alliance in Chicago, he helped raise money for community health grants. Frequently, he has participated in Community Theater in Cambridge and Zanesville. Handbells are something he has also played over the years and still participates in a great handbell choir at the Grace United Methodist Church in Zanesville. He let his hair grow long to portray Jesus giving the Sermon on the Mount. Dedicated to fitness training, Tom decided to learn the Sermon on the Mount while bicycling. He then decided that he would like to portray Christ giving this sermon so Tom let his hair and beard grow so he would better fit the image. It is of great importance for a storyteller to get into the character he is portraying. He presented this program in several area churches. Tom donated his hair to Locks of Love after portraying Trixie. While his hair was long, Tom also decided to dress as Trixie with heels and a short skirt. When he was working with the Doctors’ Wives’ Club, he auctioned off the opportunity to take pictures with Trixie and raised quite a bit of money for their projects. Tom likes to tell all sides of the story so portrayed Judas returning from the dead. The role of Judas coming back from the dead was also a fulfilling role that he portrayed. Here Judas asked that he quit being terrorized as he was sorry for the betrayal. It ends with a warning to the audience not to be like Judas. Tom showed his artistic side by this chainsaw carving of a 10′ bear. Tom gave a bit of good advice to himself and others who find themselves overwhelmed with tasks and commitments. “Learn to say NO to anything that is neither necessary nor meaningful.” That’s great advice from a man who also likes to spend time with his granddaughter. This Baked Alaska proves to be a popular dessert with the Swans. A favorite story of Tom’s is “Selfish Giant”, however, his favorite one to tell is “Three Billy Goats Gruff”. There he has fun using different voices to entertain children. As a royal bard, Tom shared stories with Queen Victoria during Dickens Victorian Village season. Tom’s goal is to make a living telling stories. If you would enjoy having Tom tell stories at one of your events, you can contact him at lswan@columbus.rr.com. Tom and Linda head off on their Vespa motorscooters, which Tom calls “Hardleys”. When Tom’s not telling stories these days, he enjoys riding motorbikes with his wife. He’s also been experimenting with making wine – from honey instead of fruit. Sometimes he adds a bit of cinnamon, cloves or orange for a different taste treat. No one can say that Tom Swan lives a boring life. Judi enjoys telling her stories to a roomful of listeners. A great storyteller is a rare treat as they connect with the heart and soul of their listeners. One that has been blessed with that talent is Judi Tarowsky from St. Clairsville. Her road to storytelling began with a letter. She was probably even telling stories as a child when she wore a fire hat. When Judi was in 8th grade, a friend of hers said she had a cousin in Wales, who was looking for a pencil, which we would call a pen pal. Judi was looking for one too. Since Judi comes from a Welsh background, this contact seemed perfect . Judi thought about it and decided to enter the Adult Liars’ Contest at the Strand Theatre Storytelling Festival in Moundsville, West Virginia. She won! This storyteller’s favorite story is her version of “The Three Little Pigs”. Since then she has even gone to Wales twice to perform as a storyteller. While there, she told one of her favorite stories, her version of “The Three Little Pigs and the Big Bad Fox”, based on an old folk tale. While storytelling was new to Judi, she had been involved in writing for much of her adult life. Previously she worked as a newspaper reporter and for an advertising agency. Putting words together is something she has done well for years. She becomes very involved with her stories. Today, she tells two kinds of tales: tall and true. Both of them involve extensive research. While she delights in telling old legends, historical presentations have become very popular. After selecting a story from history that is little known, interesting facts are then collected. This storyteller wants to make certain that all her facts are correct before writing her story. But she doesn’t memorize the story. Judi knows it very well from her research and just tells it. Every time it’s a little different. The story of the U.S.S. Shenandoah is an audience favorite. Her story of the crash of the Shenandoah dirigible brought the flight of the airship to life for those present. This original story, “The Heroes of the U.S.S. Shenandoah”, has become one of her most popular presentations in this area since the crash happened near Ava between Byesville and Caldwell in 1925. “a Sodom of Sin anointed with oil” ~Howard Lee, “The Burning Springs”. Or by pointing out that when fire reached that town, the first thing the tavern keepers carried to the mountains was their supply of whiskey. They wanted to keep it from the Confederates, and it was expensive besides. Her extensive research captivates the audience. Humor added to historical facts keeps the audience in her grasp. Following her storytelling, there are always many questions to be asked regarding whatever subject she has been sharing. Her knowledge of her subject is impressive and shows much time spent in research. At the present time, there are over forty stories in her repertoire, but that list is constantly expanding. She frequently speaks at libraries, festivals and civic clubs. Her programs are so varied that she has something for any age group. One of her special workshops, “The Bones of a Story”, guides people to find their own family stories. For more information, contact Judi at mtarowsky@gmail.com . Artist, Charlie Gant, made these sketches while listening to Judi’s stories at Jackson Mill Jubilee. It will soon be her new CD cover. Judi hopes to continue sharing her research through storytelling and perhaps speaking at some larger festivals in the future. In her spare time, she enjoys baking, cooking and traveling by train – most likely with a tablet by her side to record future story ideas. Step out of the Appalachian Mountains of Moundville, West Virginia into the Palace of Gold, which reminds many visitors of life in India. “It felt like I was coming home,” described the feelings of one recent guest from New Delhi. Greeted by Andy Fraenkel, master spiritual storyteller, we were led on an in depth tour of the Palace and grounds. Andy also explained through story, many of the beliefs of the people who built this magnificent structure. Only outside pictures were permitted at the Palace of Gold. 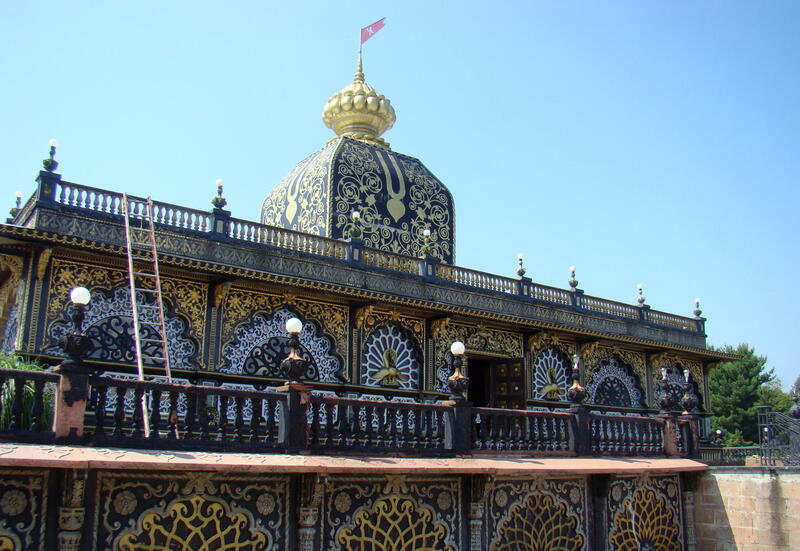 This beautiful golden temple glistens in the sunlight as sunrays catch on the gold coated roof and walls. Construction began here in 1974 with the intention of making a beautiful home for Prabhupada, who founded the Hare Krishna Movement. While Prabhupada did visit the Palace four times during its construction, he never got to live at the Palace due to his death in India two years before it was finished. Upon its completion in 1979, it became a memorial and an instant attraction. 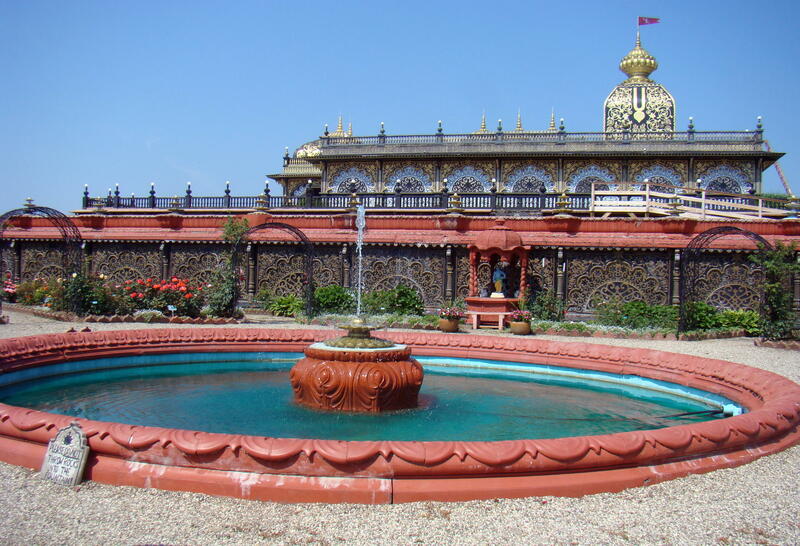 It was decided to build a palace around the original home, adding abundant marble, gems, and gold to make it remind others of similar places in India. This was a huge undertaking and took five and a half years to complete at a cost of $400,000. That may not seem like much for a beautiful palace, but costs were kept low due to volunteer labor of the commune that lived nearby at that time. When the Palace of Gold opened in 1979, 25,000 people were on hand. Before entering the Palace of Gold, you will be struck by the beauty of their famous Rose Garden, the perfect place for a time of meditation amongst the beauty and scent of the blossoms. 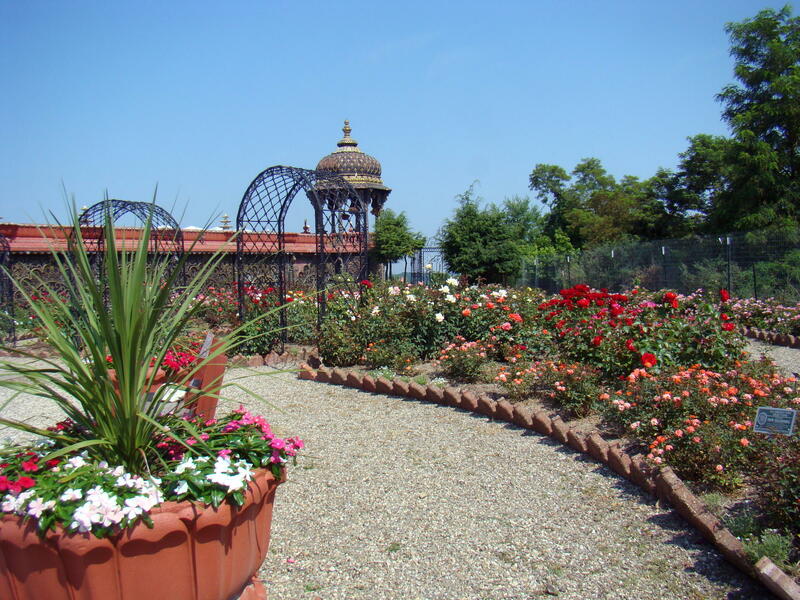 There are over150 varieties of roses plus a hundred water fountains to add to the ambiance, as you bathe yourself in the morning sun. A lotus pond is covered with blossoms in this secluded Garden of Time. It’s the perfect place to spot a white swan or duck floating among the lotus. 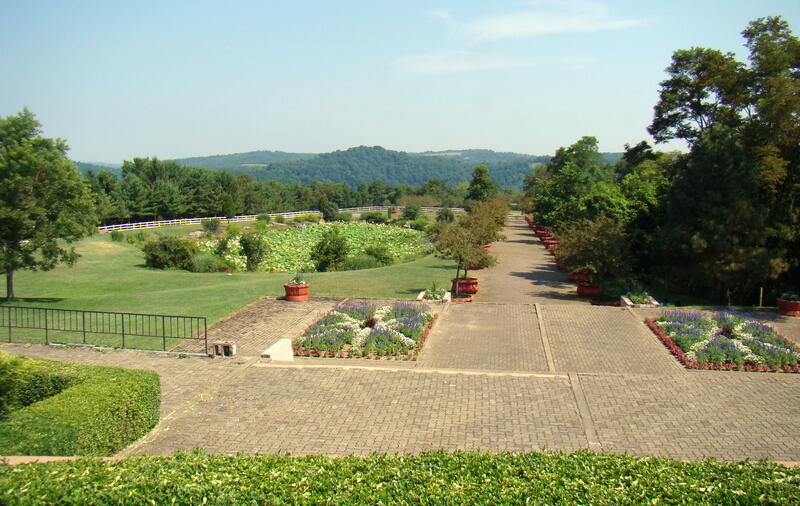 The pathways around the grounds make a peaceful place to walk with nature, and enjoy blossoms from spring through fall. Gorgeous peacocks are frequently seen wandering through the garden as well. From here you can see vistas of three different states. Now it’s time to discover the inside of the Palace of Gold. Sunshine again plays its role in enhancing the stained glass windows. Sparkling crystal chandeliers reflect inner light from the mirrored ceilings. A Great French Chandelier, over 150 years old, brightens the room so semi-precious stones and pure gold glisten. While it is called the Palace of Gold, there are actually only about 80 ounces of gold used in construction. Gold leaf was applied in very thin sheets, 1/1000″ thick, and brushed onto the walls and ceiling. As you walk on floors of marble imported from Europe, Asia and Africa, there are designs on the walls describing the Krishna religion. One wall had several peacock designs as they are a symbol of royalty and bring good fortune. Lord Krishna wears a peacock feather in his hair. Cows and elephants have their special place also. The cow is revered as a source of food while the elephant is a symbol of wealth as kings rode them during peacetime and wartime. During the 1980’s, an elephant actually stayed on the grounds near the Palace of God, but it didn’t like the cold weather. So they actually got a semi and sent the elephant to Florida on vacation for the winter. But that expense only happened one year! 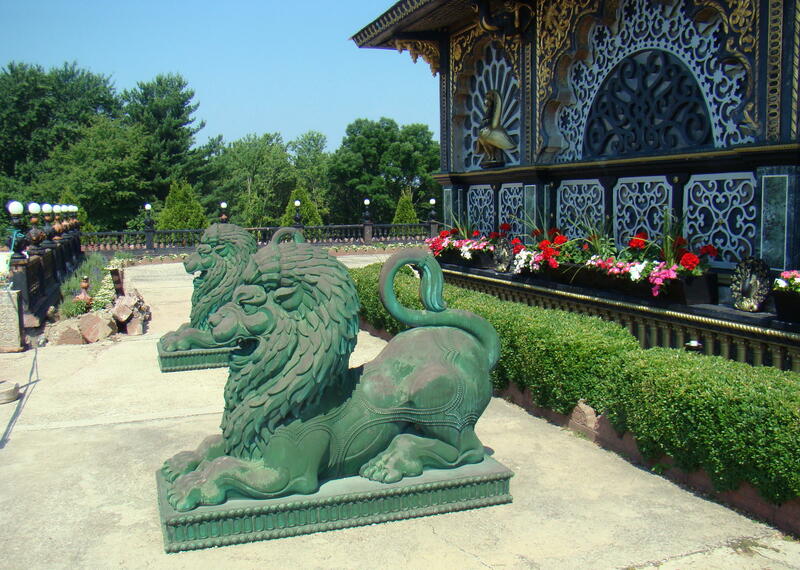 The Palace of Gold is located at 3759 McCreary Ridge Road outside of Moundsville, WV. Take route 250 South, which is a curvy, mountain road and watch for signs to direct you to the Palace of Gold. It is very well marked.